Beverly Acha was born in Miami, FL, holds a BA from Williams College and an MFA from Yale University. Solo shows include Warm Form at Underdonk in Brooklyn, NY (2018) and Mutualities, Roswell Museum and Art Center in Roswell, NM (2016). 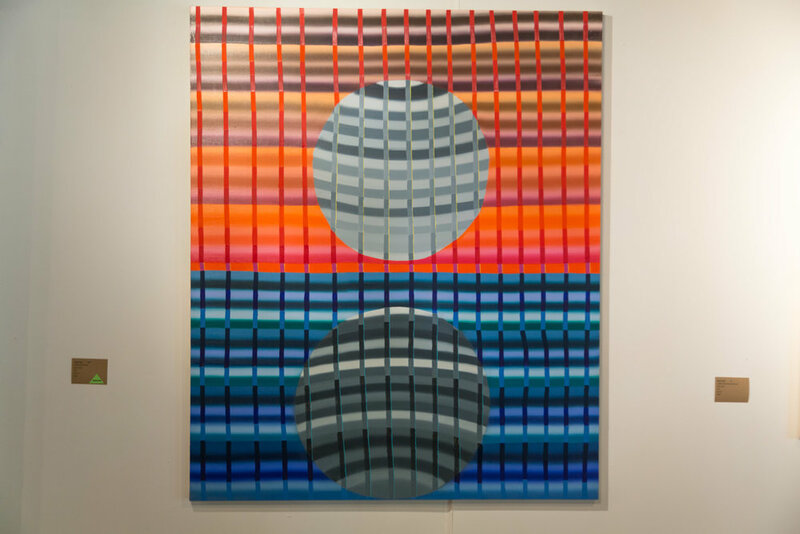 Recent group exhibitions include Change of State at Wassaic Project, Wassaic, NY, I See an Omen at Benaco Arte, Sirmione, Italy, Noonlight at Blackburn 20/20 Gallery, NY, NY, UPROOT! at Smack Mellon, NY, NY, No Regrets at LeRoy Neiman Gallery, NY, NY, and Museum Starter Kit at El Museo del Barrio, NY, NY. Acha’s residencies and awards include Skowhegan School of Painting and Sculpture (2018), Lighthouse Works Fellowship (2017), Wassaic Project Residency (2017), Roswell Artist-in-Residence Program (2016-17), and Robert Schoelkopf Memorial Travel Grant (2011). 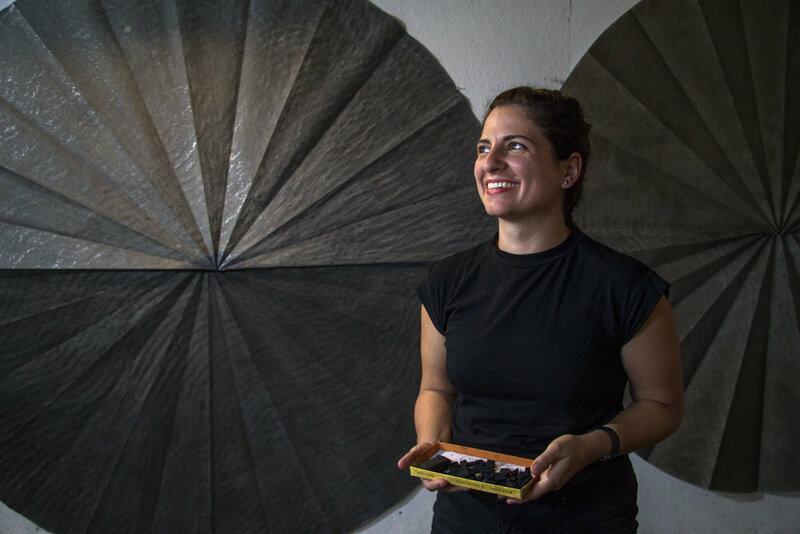 Acha is currently a Visiting Assistant Professor in Studio Art at Oberlin College. Your involvement with the Wassaic Project was through a summer residency and as an education fellow. How have your experiences with the Wassaic Project impacted your artwork? Spending time in the little Wassaic valley, in the barn studios, next to the river and the train, made me realize just how deeply my work is linked to my environment. Before arriving in Wassaic I’d spent one year living in Roswell, New Mexico, which made the contrast in environment starkly evident. The barn studios are rough and whatever is happening outside is felt inside. 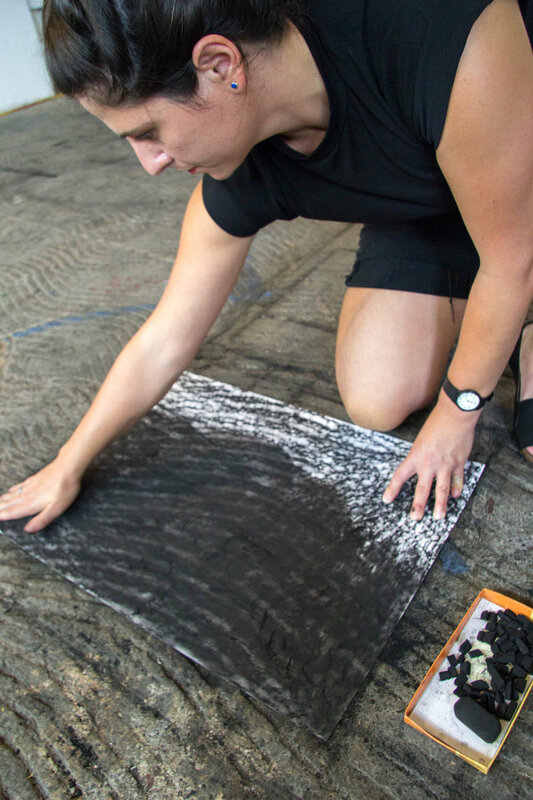 I was really interested in the textures and structure of the barn and subconsciously or not, I spent most of my time in Wassaic making large scale rubbings of the concrete floors which have wavy rake marks. The three months I spent in residence gave me space and time to experiment in ways I had not had space or time to do before. This experimentation not only started me on a new body of work and new ways of working, but also affirmed aspects of my practice which were already present, including my interest in responding to my environment, markers of time and cycles (like sound — the train and sound of water), structures (architectural) and printmaking processes (making rubbings), were all present in the work I made in Wassaic, even though it was experimental and completely new for me. Your practice includes painting, drawing, printmaking, sculpture, video, and zine publishing. How do you connect these various aspects of your work? I consider using different media part of my process. Each medium has its own set of physical and material characteristics and thus speaks in its own way, painting is based on an illusory window, while sculpture changes the way we respond to our physical space — we are responding to a real object in real space — while video deals with capturing and representing space and time, and printmaking involves chance and the process of making a copy of something that already exists. Each medium offers me a different vocabulary and process to run my ideas through, allowing me new elements to respond to, manipulate, and explore. I made my first zine as a political response to the 2016 presidential election. It brought together over 70 artists who each responded to a word of their choice that characterized the campaign and election season. The most exciting aspect of making the zine was that it allowed me to bring artists that were geographically separate, together. Zines are essentially a document of responses to a specific topic by a group of contemporaries in a specific moment in time. I am now making a book out of another zine I made on the topic of doubt in the artistic practice. These collaborative book/zine projects are a social element of my practice, they begin to tap into what happens in the life of an artist, our community, concerns, interests, etc, and allow me to connect with and foster connections between people in my community. Landscape is a theme that is abstracted, explored, and discovered through many of your paintings, which seem to have become more visually complex over time. Can you say something about how your interest in landscape evolved through the years and led to your current paintings seen in this exhibition? Landscape is rich for metaphor! I have been interested in literature and poetry since I was very young. In particular, I have vivid memories of descriptions of place from novels and poems. I remember reading Gabriel Garcia Marquez’s One Hundred Years of Solitude and understanding the personification of space, nature, and landscape as psychological and in that way the magical elements of his stories felt like he was making something invisible, visible, something interior, exterior through embodiment in space. Also, I grew up in Miami, where the landscape is very flat, no skyscrapers, so you can always see the dome of the sky. This experience of always seeing the sky, the blinding light almost year round, the short intense rainstorms, and even the way the humidity was oppressive, shapes my sensory memories. The way we experience certain spaces gives us specific feelings. I feel freedom and safety in wide-open landscapes and discomfort in mountainous and forested areas where my vision is blocked by trees, mountains. Landscape is a living body; it is the earth from a specific perspective. And that perspective is a very human one, for instance, the presence of the horizon line is specific to our being on this earth and our being a specific scale in relationship to the earth. Also landscape is the space we exist within, it is our place, and in that way it is our context, it is what is not us, but that which surrounds us. In this way it is inextricable from who we are and how we are. To understand our space and the laws that govern it and us has always been a human endeavor. In my work of the last few years I have been interested in making the forces, laws, energies, that exist around us, like heat waves, gravity, light waves, visible in my paintings. I’ve starting thinking about the relationship between diagrams/schemas and my paintings. I think there is a similar desire to depict something that is intangible but present, which is similar to the purpose of diagrams in astronomy and physics textbooks. Your work speaks to a deep understanding of color theory and color interaction, as well as your attraction to geometric structures and their subtle distortion. These three rich paintings feel as if they have been built by successive additions of color and form, similar to the additive weaving process in which the colors of the warp and weft blend and interact as a textile is created. What is your process in creating these intricate works? Yes, that is a great description of how the work is made! I typically begin with one or two forms that create an underlying structure for the composition. So, for example, the two almond shapes in the purple painting, “Untitled (Fishers Island Fall Sunset)," were the first forms I put down as an outline. The almond shape, which is present in many of my paintings, refers to landscape with the line between the two curves standing in for the horizon. From the outline the painting is built through successive additions of color and line. Sometimes the early forms remain visible as the focal point, as in the purple painting, and other times they end up being secondary, where another form, shape, or color becomes the emphasis. I do not plan the paintings out before beginning, but instead figure them out along the way, like I am building the train tracks while riding the train (my friend Cate White just said this to me on the phone the other day and I can’t stop thinking about how apt a metaphor it is for art making, but also specifically to the way I build my paintings). I weave the space step by step deciding which forms of colors will overlap and how shapes and colors will meet. As I work through the painting, I typically draw my painting at different stages, trying to work out the next steps, or how different decisions would transform the space in the painting. I am interested in how color operates on us in different ways — colors vibrate depending on what other colors surround them, they are referential (can recall memories of being in a certain place or a temperature etc), and can create moods or call on specific emotions. All of these are elements of the psychological. For the paintings on view here I was very interested in capturing a dusk, nearly sunset kind of light, just before it is completely dark out. I made these paintings on Fishers Island, NY and in New Haven, CT in the Fall, when the time had changed and it was getting darker earlier, which was one of the reasons I became interested in dusk. At sunset (and sunrise) we see how quickly time passes, shifts in light happen every second. There is an element of time similar to this in my work, I am interested in the paintings “becoming” something else, or being on their way to something else — an energetic moment being captured for a short moment. In this way there is also a link to my process of allowing the paintings to become as I work on them.